Using cloud technologies isn't risky if the migration and implementation process is done correctly. The cloud isn't something you should fear. Rather, you should embrace its operational benefits. To get the most out of cloud services, you need to approach a database migration the right way. As with any upgrade or migration scenario, there are risks that you need to account for and mitigate. 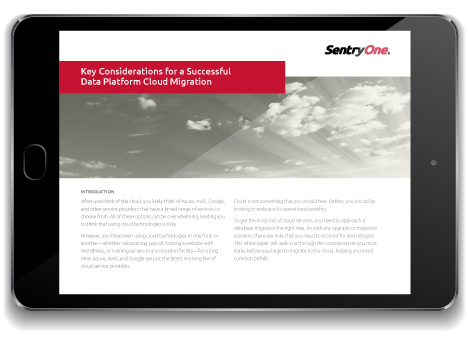 In this white paper, SentryOne Product Manager John Martin will walk you through the considerations you must make before you begin to migrate to the cloud, helping you avoid common pitfalls. How to use a hybrid of the waterfall and Kanban style to plan your database migration and implementation. The four phases of waterfall: discovery, testing, migration, and operational support. Reasons for using Kanban rather than scrum for the migration project. Tips for "living with it every day" post-migration. If you don't put in the preparation work up front, you can end up spending more money than if you retained the workloads on-premises. However, with proper discovery, analysis, validation, and documentation underpinned by a pragmatic approach to planning, you can achieve a higher level of success.